Child born in the UK to Indian parents may acquire British citizenship! In a new ruling, the High Court in the UK has ruled that a ‘stateless child’ should be given British citzenship by right under the British Nationality Act 1981. A recent Judgment by the UK Court mean children born in the UK to an Indian national parent may be entitled to British Citizenship. 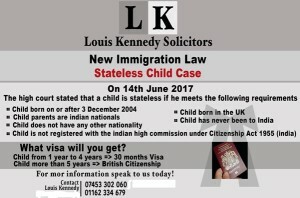 According to a new precedent in line with the UK nationality act, if a child born in the United Kingdom to Indian parents on or after 3rd December 2004 who never had registered his/her birth at Indian High Commission, never obtained Indian or any other nationality, have completed his/her fifth birthday, the child may apply for British Nationality in accordance with British Nationality Act. In this scenario if the child is 5 years old the he/she is entitled to be registered as a British citizen and if the child is under 5 years old then she/he will be granted limited permission to remain in the UK. However, the child has to be proven that it was stateless. The ruling made on June 14, 2017 is likely to open up applications in this respect as Indian parents can register such a child for British Citizenship regardless of the status of the parents in the United Kingdom. However, the acquisition of British citizenship by the child does not in itself give an entitlement to British citizenship to the parents, although if the child is solely British and cannot live anywhere else, then there may be some impact on parent’s application for discretionary leave to remain. Intentionally causing the child to be stateless by not registering the child with the authorities of the parents’ citizenship may not make the child stateless. 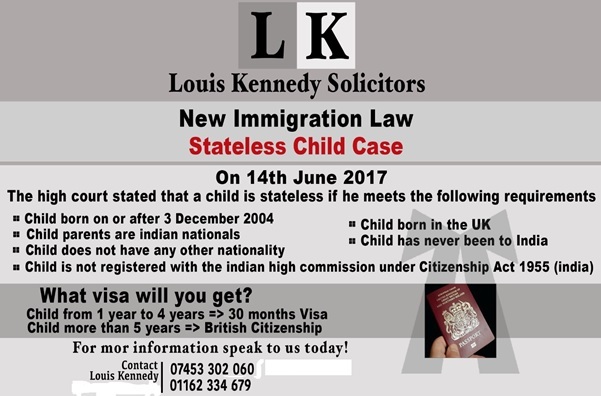 If a UK-born child is deliberately kept stateless for the first five years of their life, that gives them an entitlement to register as a British citizen under Section 3, Schedule 2 of the BNA 1981. The UK government may seek to lobby the Indian government to change their law in regard to it granting automatic acquisition of citizenship by descent abroad for their nationals. India do not allow automatic acquisition of citizenship by descent abroad, but makes it conditional on registration with consular officials abroad. The UK government may appeal the judgment to either the Court of Appeal or the Supreme Court, as this judgment may have the perverse effect of increasing intentional statelessness. “For the purposes of the statutory provisions in issue, a person is stateless if he has no nationality. Ability to acquire a nationality is irrelevant for these purposes. A child born on or after 3 December 2004, outside India, of parents at least one of whom is an Indian national, and who has not been to India, is not an Indian national unless registration of the birth has taken place in accordance with the provisions of the Citizenship Act 1955 (India) as amended. If the child has no other nationality, the child is stateless for the purposes of paragraph 3 of Schedule 2 to the British Nationality Act 1981 and, if the other requirements of that paragraph are met, is entitled to be registered as a British citizen. If, therefore, C’s birth had on the date of the decision under challenge not been registered, she is entitled to British Citizenship. One Response to Child born in the UK to Indian parents may acquire British citizenship! My solicitor told me If child is under 5, application will be refused under paragraph 403 (c) of the Immigration Rules. This is because law for over 5 years is different (British Nationality Act 1981) to law for under 5 years (Immigration Rules). So this only applies to over 5 children.